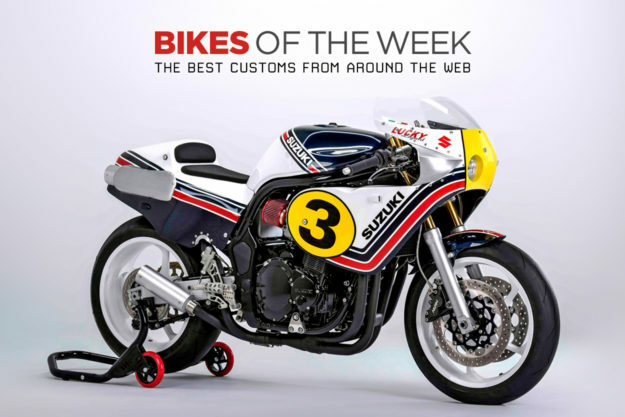 The best-looking Suzuki Bandit we’ve seen in years, a Honda Grom with a 500% horsepower increase, a delicious Bonneville T120 finished in British Racing Green, and an ancient BMW R68 hiding some very sneaky modern upgrades. The custom builders have been smoking some strong stuff this week. 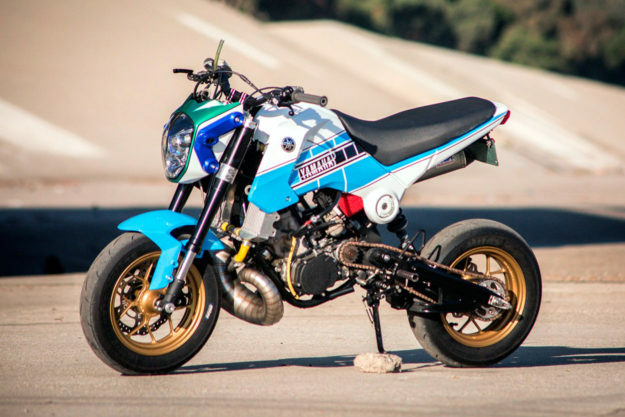 Honda ‘Gromaha’ by Jesse Davis Honda’s Grom may have redefined the fun of motorcycling. Riding one, you can’t help but smile incessantly as its miniscule proportions make you feel (and look) like a giant child. Its tiny motor demands a full twist of the grip, at all times. Unless you’re Jesse Davis, and you’ve shoehorned a Yamaha YZ250 engine into the gap left by the stock Honda 125 mill. Without modifications, the 2-stroke swap takes horsepower from a comical nine to a maniacal 49. Fit up a Tyga Performance exhaust kit, like Jesse has, and the powerband gets even crazier. Thankfully Jesse also upgraded the suspension on his ‘Gromaha’ to include a JRi rear shock and the forks from an Aprilia RS125 GP bike. 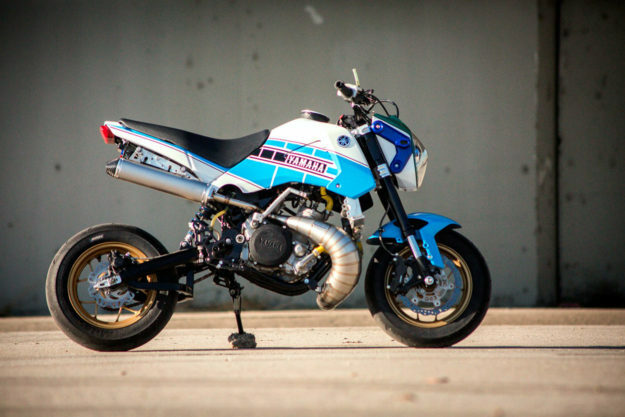 Suzuki Bandit 1200 by Italian Dream Motorcycles Sergio Giordano, the man behind Italian Dream Motorcycles, is obsessed with creating gorgeous motorcycles that perform brilliantly. Instead of sacrificing function for form, Sergio and his IDM crew focus efforts on the R&D necessary to find optimal balance. He also has a thing for racers of the past. 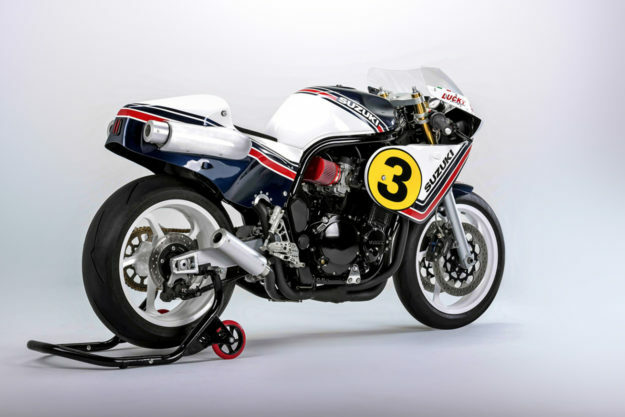 Lucky X was designed to pay honor to racer Marco Lucchinelli and the Gamma 500 he piloted to a championship in 1982. 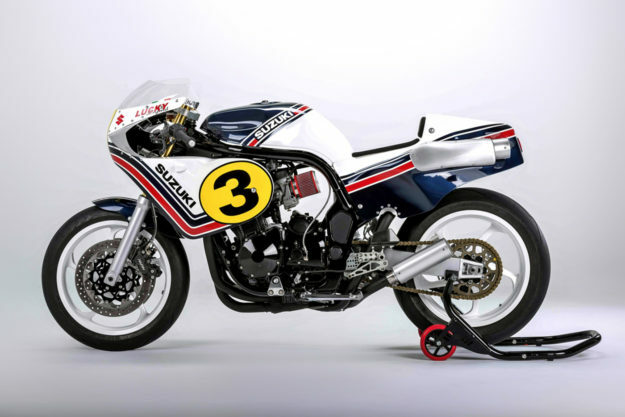 But instead of blowing the dust off of an old half-liter two-stroke, Sergio elected to transform a Suzuki Bandit 1200 into the repli-racer you see here. The biggest change, visually, is the exquisite bodywork. From the winglets up front to the cheeky 4-into-1-into-4 exhaust that flows through the tail, IDM have absolutely nailed the look and proportions. 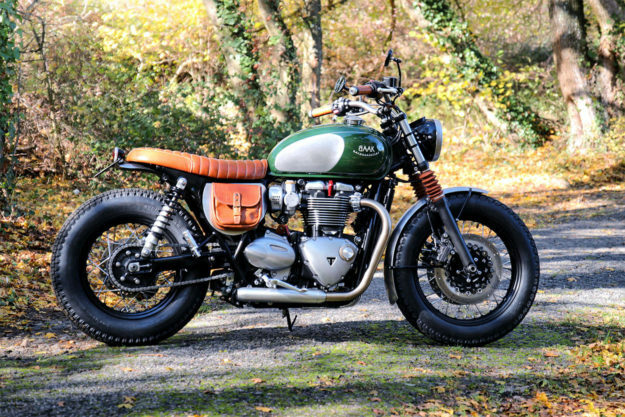 Triumph Bonneville T120 by Baak Motocyclettes The French workshop has a knack for tasteful Triumph transformations. Their changes are often subtle, but thanks to their expertise and a catalog of proprietary bolt-ons, they’ve sussed how to make even the simplest of upgrades stand out. 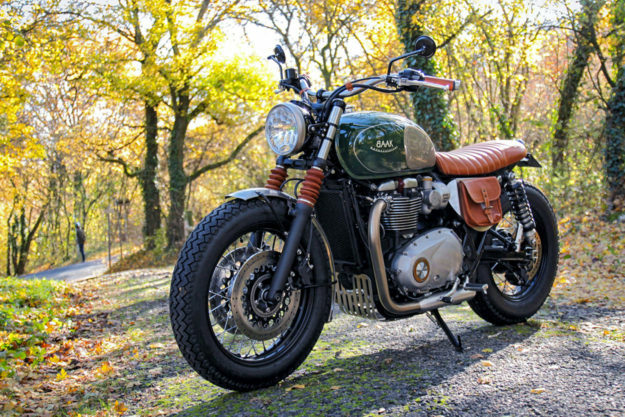 The latest build from Lyon is a British Racing Green Bonneville T120 with a bobber’s stance and a detailed finish that would make Hinckley’s engineers blush. Following the lead of a previous build, Rémi Reguin and his crew swapped the Bonnies hoops for a set of matching 16-inchers. It now rides on Avon MKII rubber but it took some suspension work to deliver that dead-nuts, level stance. Up front, a new set of machined triple trees holds the factory forks, but in the rear the shocks sit nearly an inch lower. 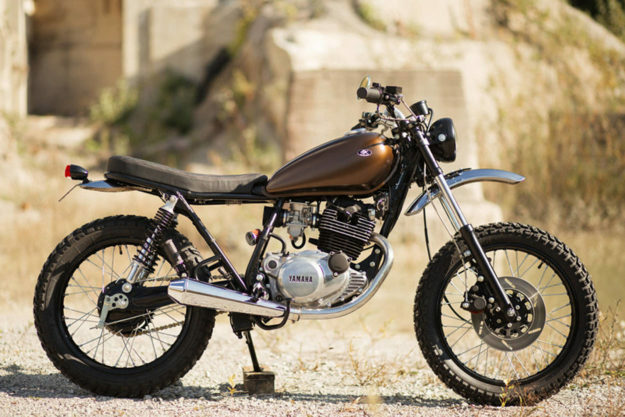 Yamaha SR250 by Retro Bikes Croatia Croatia isn’t the first nation that comes to mind when studying custom bike culture. And according to Zeljko, the man behind this Zagreb-based shop, it’s also not a spot where smaller displacement rides do well. 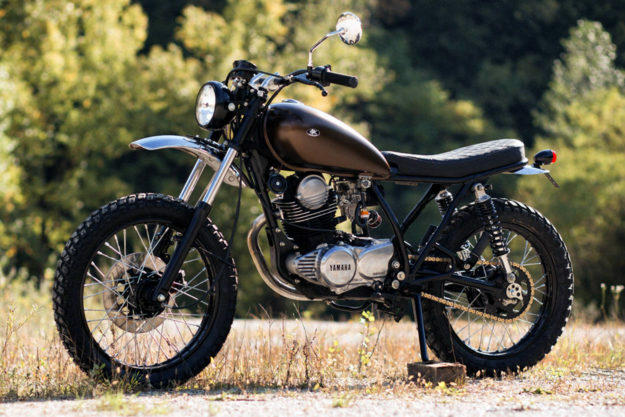 Those are two things he’s aiming to change, by transforming a rusting but lightly used Yamaha SR250 that popped up on his radar. The goal was to capture a retro enduro vibe and make this scrambler appear as visually ‘light’ as possible. The Yammie’s subframe was the first to go and a new, flatter, hooped unit was welded up. Beneath the new tubing, the old airbox was binned and the battery moved under the swingarm to create a triangle clean enough for a white glove test. BMW Bitsa by Kacerwagen The last time we saw something roll out of Kacerwagen’s Spanish garage, we were drooling over their carbon-clad Aprilia. 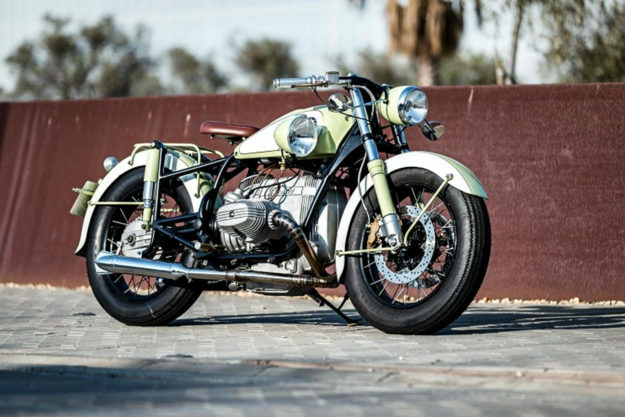 But we reckon Chus and his crew have outdone themselves with their latest project, this BMW ‘R168’ dubbed The Basque. Yes, you are correct. There’s no such thing as a BMW R168. What this is, though, is a re-interpretation of the iconic R68 that’s been underpinned by an R100RS. That meant the Kacerwagen crew had a literal ton of work ahead of them, and the only remaining part of the original frame is the engine cradle itself. Everything else had to be heavily modified to send this Beemer back in time to work with the vertical, custom-housed Hagons and that vintage perch. The front and rear fenders are true R68 units, but were modified to work with the custom frame—and hover above a set of new spokes.